Both the pancakes and the pork filling are best if served warm. You can make the pancakes earlier in the day, and reheat once you’ve made the filling, or pre-cut all the filling ingredients, make the pancakes and wrap them up temporarily, then quickly cook the filling, and serve. 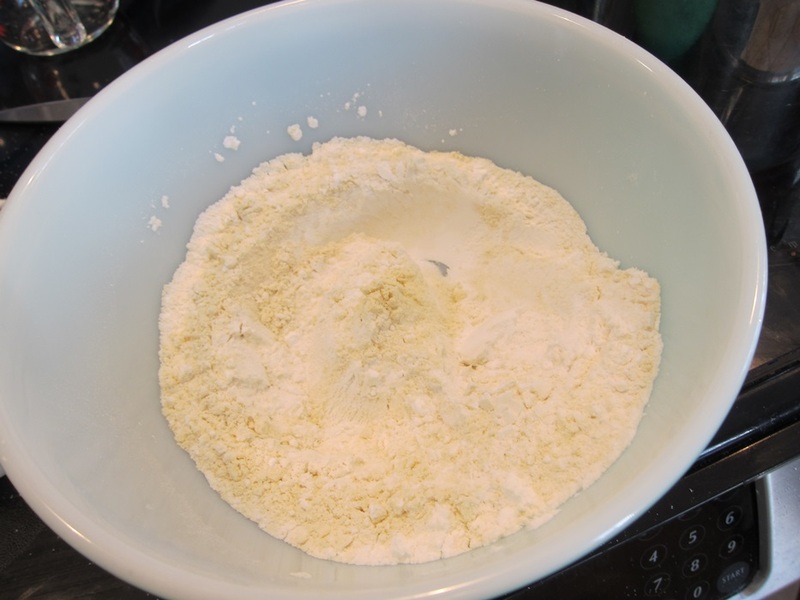 In a medium bowl, stir together the flours, xanthan gum, and salt. Stir in the boiling water with a fork, then add the cold water and mix. Knead, in the bowl, until the mixture comes together – it’ll still be hot, but shouldn’t burn you. At this point in the winter, it’s kind of pleasant! 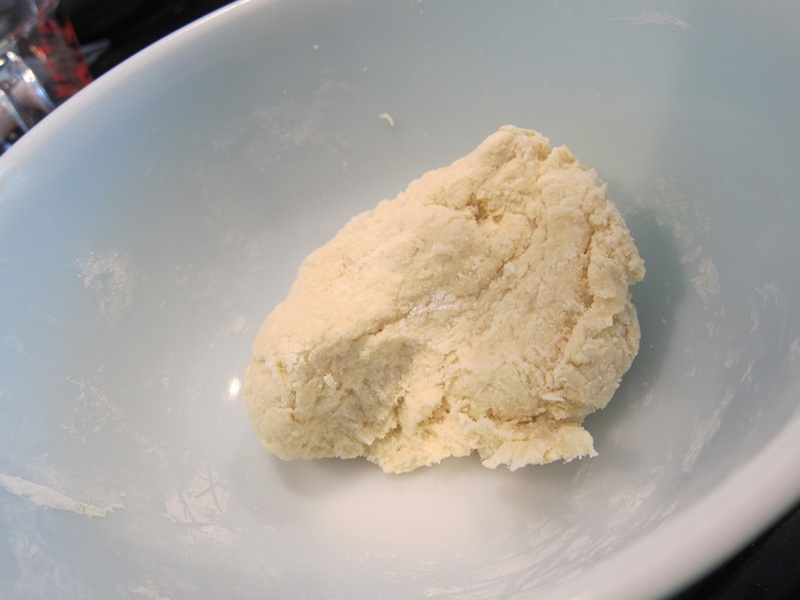 Divide the dough into 4 pieces, then divide each piece in 4, creating 16 small balls of dough. 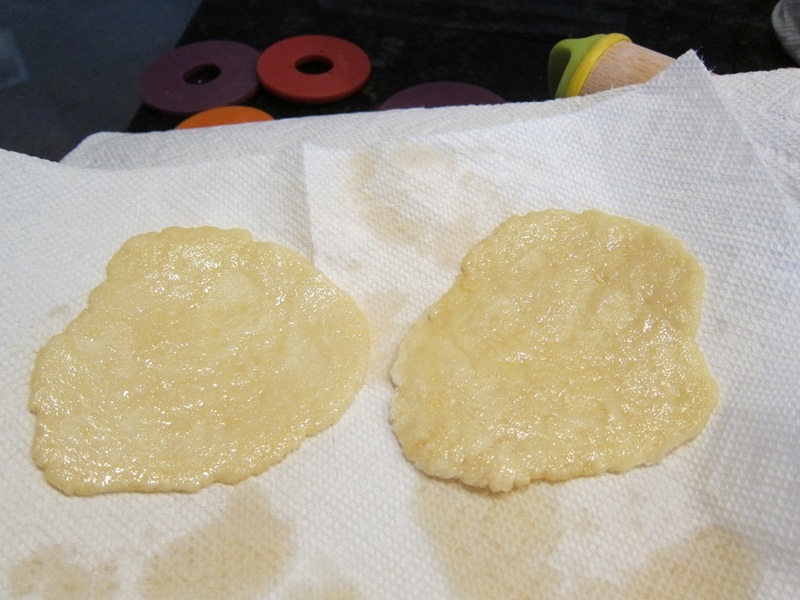 Flouring well with additional sweet rice flour, roll the first ball out to 1/16″ thick. 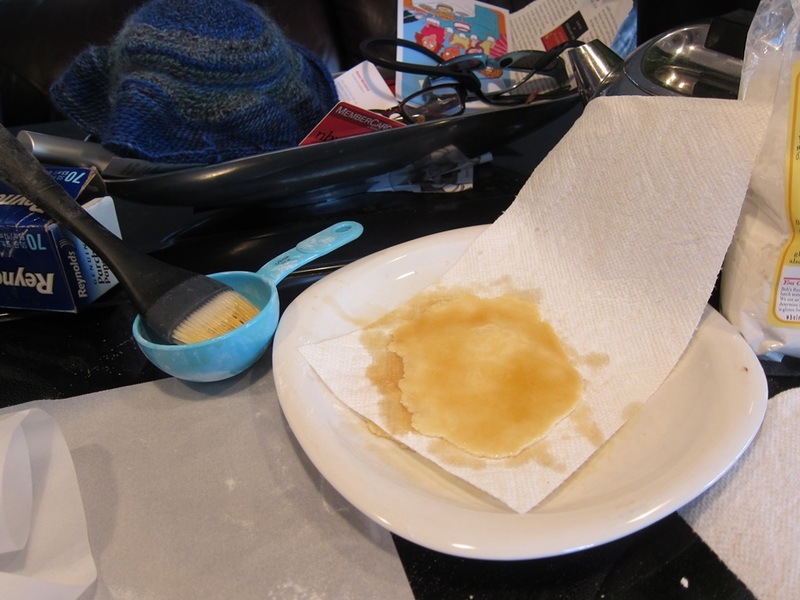 I did it between two sheets of parchment, and I think that that’s a good idea, but even with the so you should flour well, as the dough is quite sticky. 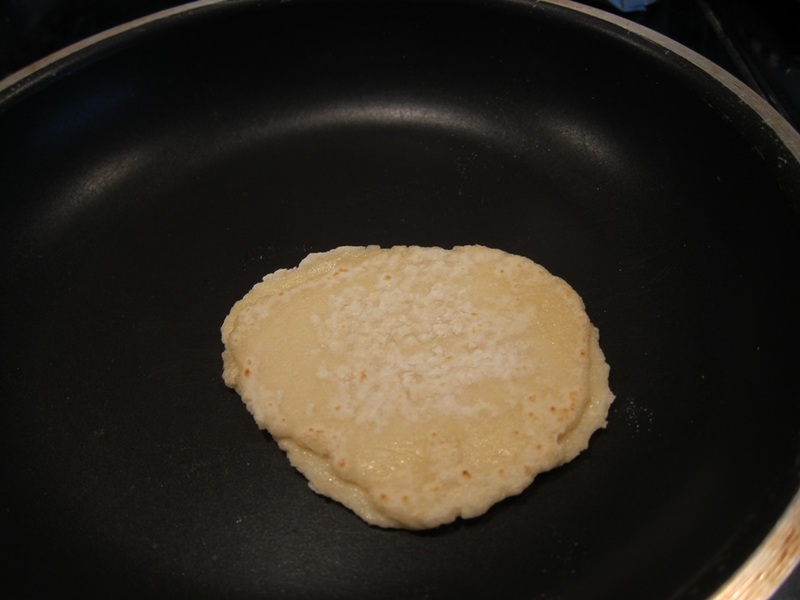 Place the rolled out pancake onto a clean kitchen towel or piece of paper towel. Brush the top well with the sesame oil, completely covering the surface. Roll out second ball of dough, and put it on top of the first, greased pancake. Cover the pair with a fold of towel/piece of paper towel. Roll out the rest of the dough, creating 8 greased pairs. It’s fine to stack them. Place another clean kitchen towel/piece of paper towel on another clean plate. Heat a nonstick frying pan over medium high heat. Place one pancake pair, without any oil, into the heated pan, and cook about 30 seconds or until the top pancake forms air bubbles. Not much in the way of bubbles, but that’s ok.
Flip, and cook the second side another 30 seconds, or until the new top pancake begins to bubble. If they don’t seem to be bubbling, remove them from the heat anyway – you don’t want them to crisp or you won’t be able to wrap with them later. Once on the fresh lined plate, pull the two pancakes apart, and cover them with a fold of towel/piece of paper towel. 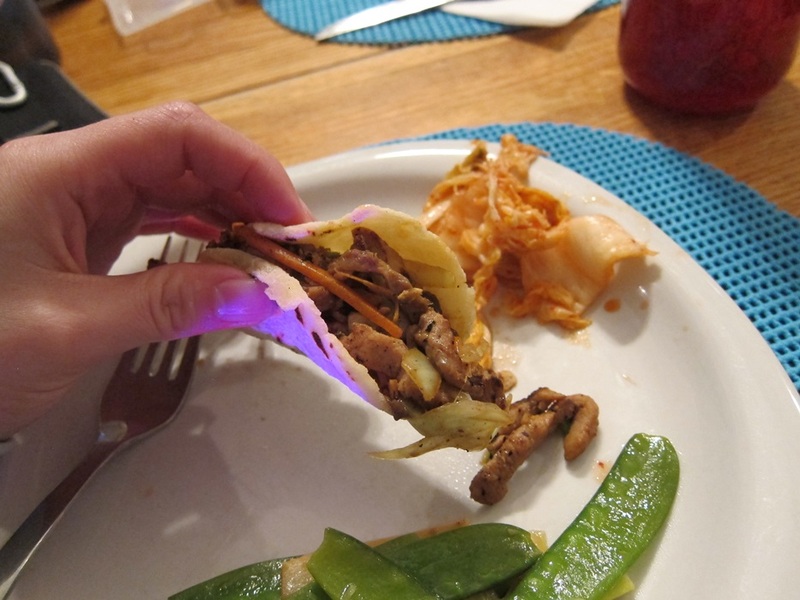 Cook the remaining pairs, then serve immediately or wrap tightly with plastic wrap. If you prepared the pancakes earlier, then when ready to eat, either steam for 10 minutes, or wrap in a barely damp paper towel, followed by plastic wrap, and microwave until hot, to get them moist and flexible again. Keep the hot pancakes covered to keep them warm throughout the meal. Leftover pancakes can be stored in an airtight container in the fridge for two days, or frozen 1 month. 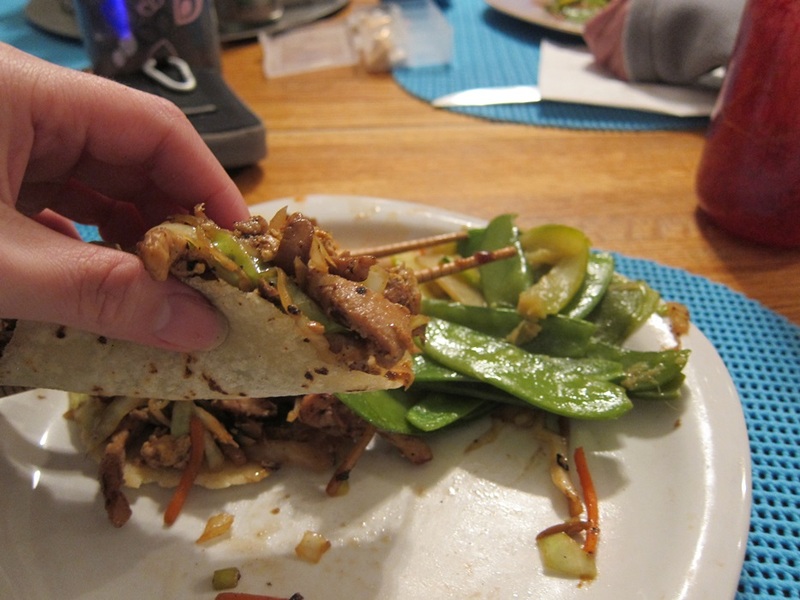 Cut the pork into 4 chunks and freeze 20-30 minutes, so that it firms up. Cut into 1/4″ thick slices, then stack and cut into thin slices. 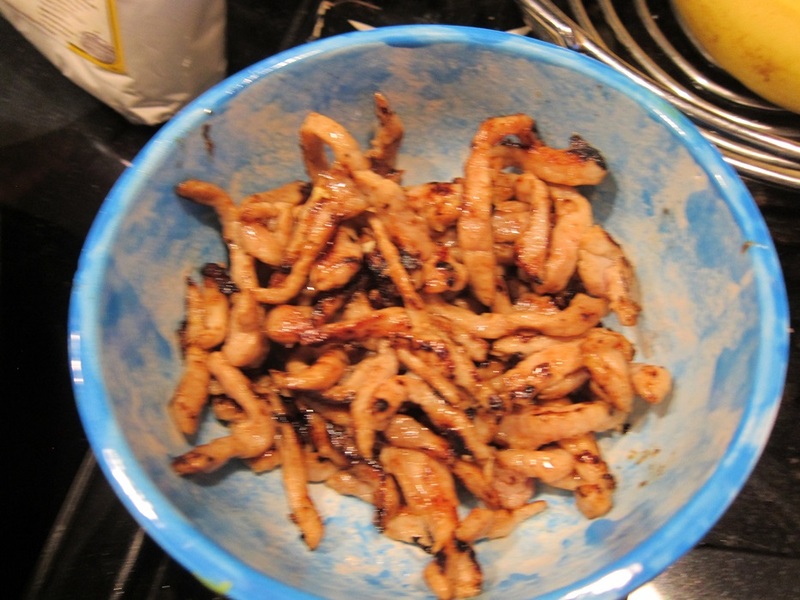 Combine the sliced pork with two tablespoons of the soy sauce, the sake, and the cornstarch. Set aside to marinade while you prepare the other ingredients. 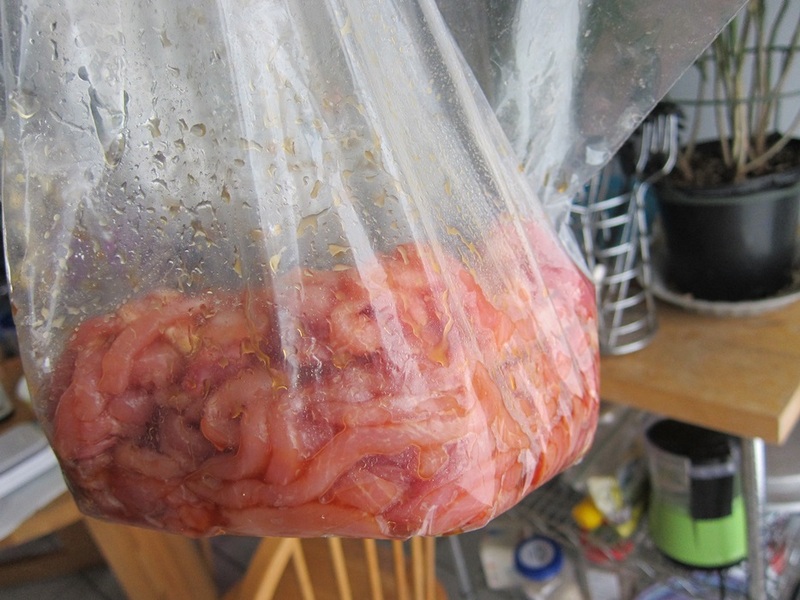 We had this chopped and marinating in the fridge the night before. Heat one tablespoon of oil in a large frying pan or wok over medium-high heat. 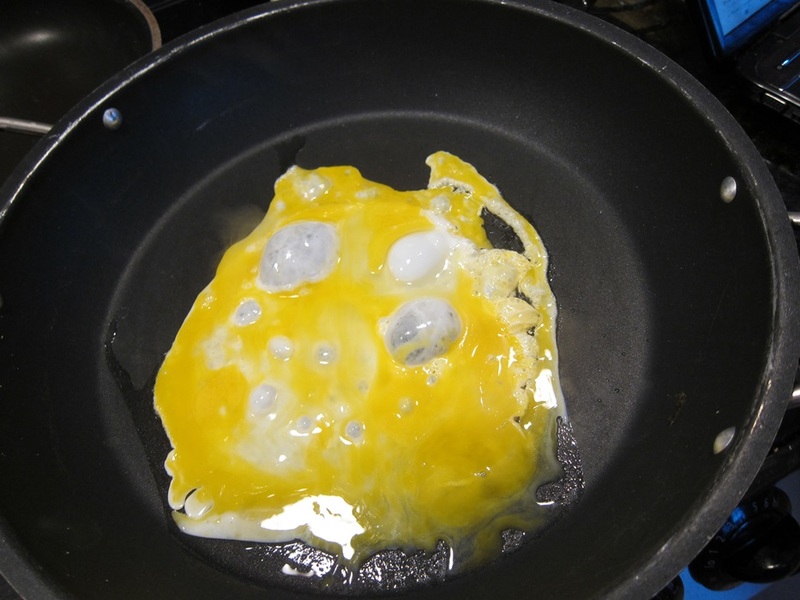 Add the eggs and let them cook until puffy, about 30 seconds, before scrambling them until cooked through, making sure to break the egg up into small pieces. Transfer to a medium bowl and set aside. Add another tablespoon of oil to the pan, return the pan to the heat, and add half the pork, letting it cook undisturbed for 30 seconds. 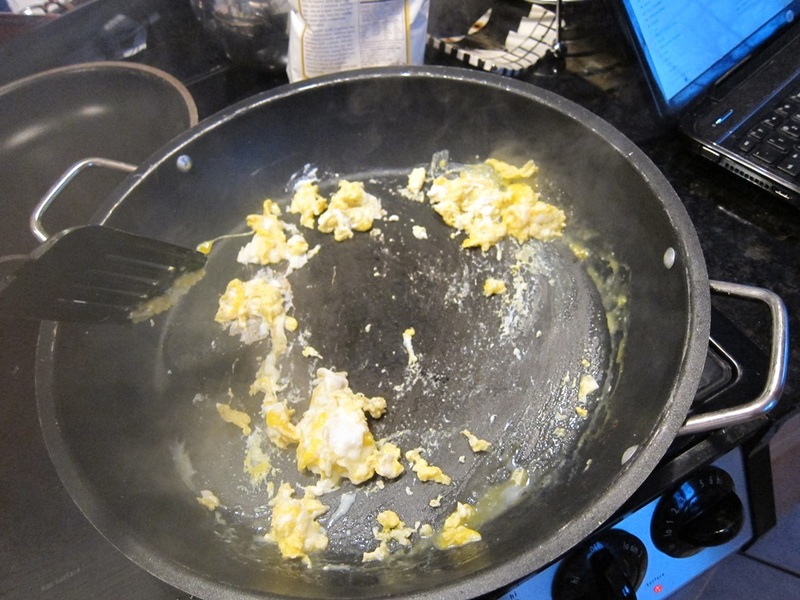 Stir, and continue to cook until cooked through, about 3 minutes, then transfer to the bowl with the eggs. Repeat with another tablespoon of oil and the other half of the pork. Whoops, I put my eggs in too small a bowl, so the pork had to wait alone. Heat the remaining tablespoon of oil and cook the garlic and green onions for 30 seconds. 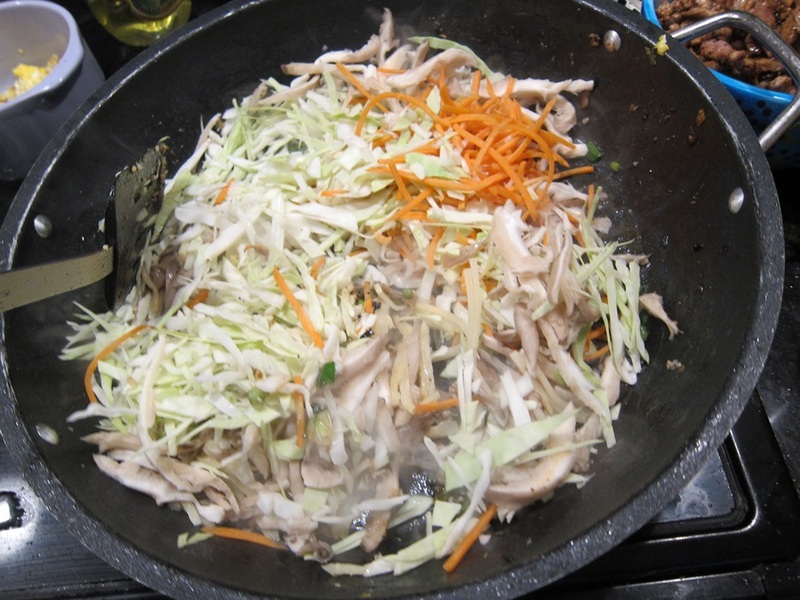 Add the wood ear, cabbage, carrots, and bamboo, and cook until the cabbage starts to wilt, about 3 minutes. Add back the pork and eggs, and stir in the remaining tablespoon of soy sauce and the salt. Cook until heated through. 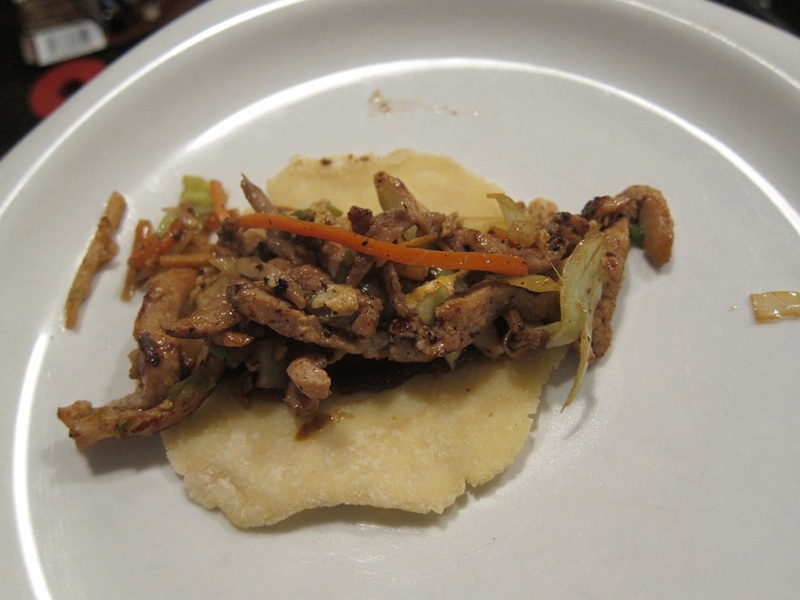 To serve, spread a bit of hoisin on one of the pancakes, then top with the pork mixture and wrap shut. 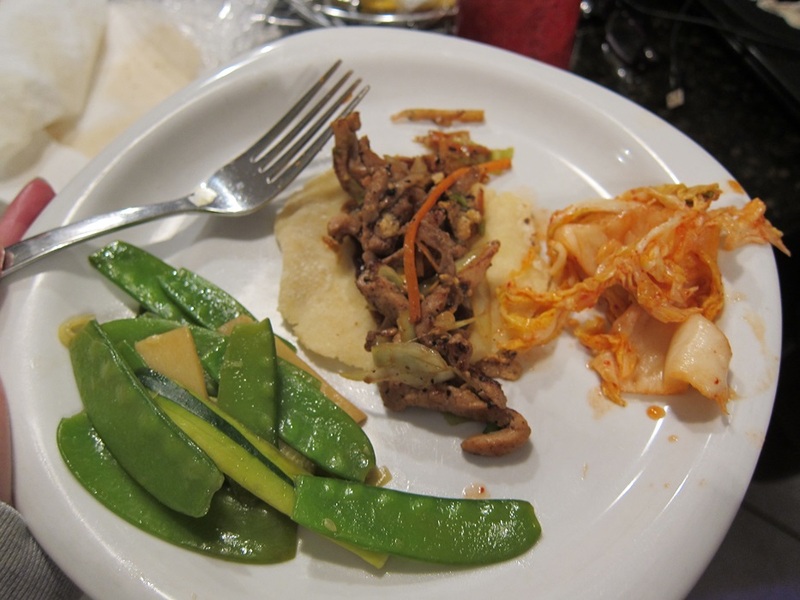 We also had some quickly stir fried veggies and some kimchi (wrong culture!) on the side. The method for making the pancakes seems a bit weird, but they wrap well, and taste just right – it’s really a great dish, and worth the effort! 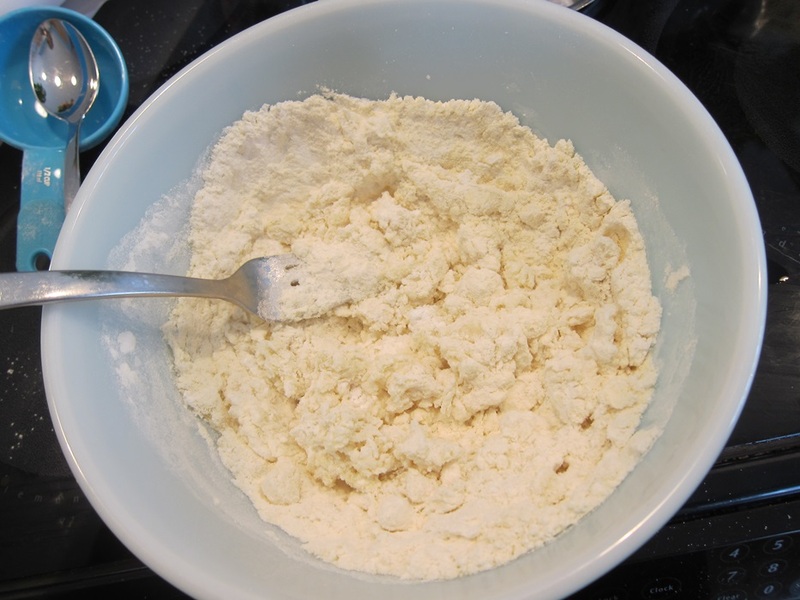 In a medium bowl, stir together the flours, xanthan gum, and salt. Stir in the boiling water with a fork, then add the cold water and mix. Knead, in the bowl, until the mixture comes together. 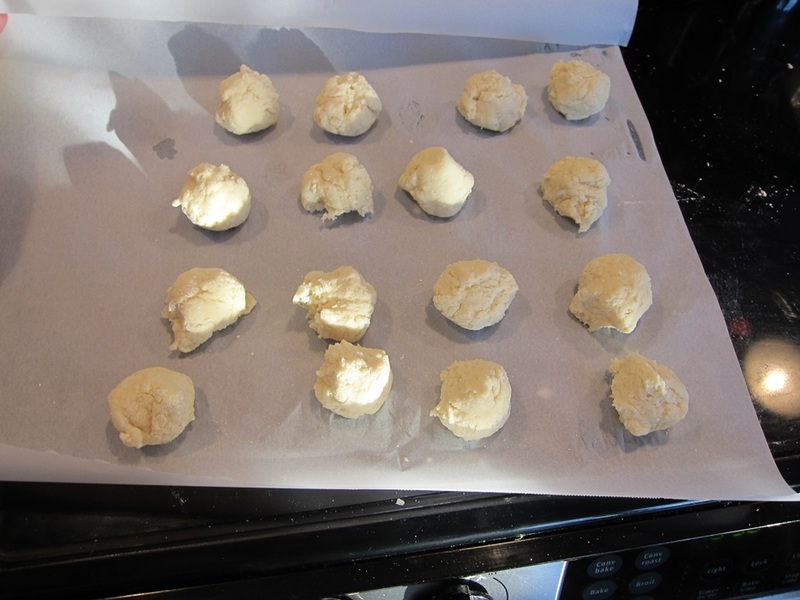 Divide the dough into 4 pieces, then divide each piece in 4, creating 16 small balls of dough. 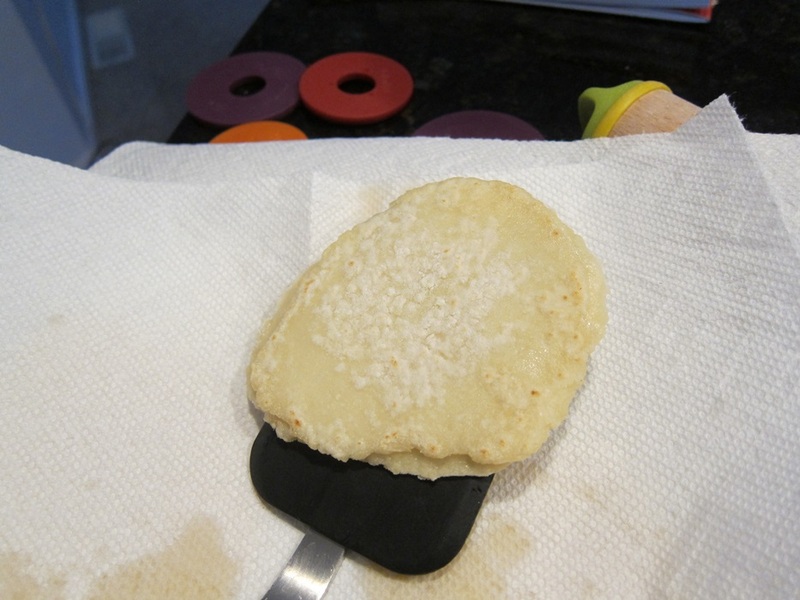 Flouring well with additional sweet rice flour, roll the first ball out to 1/16″ thick between two pieces of parchment. 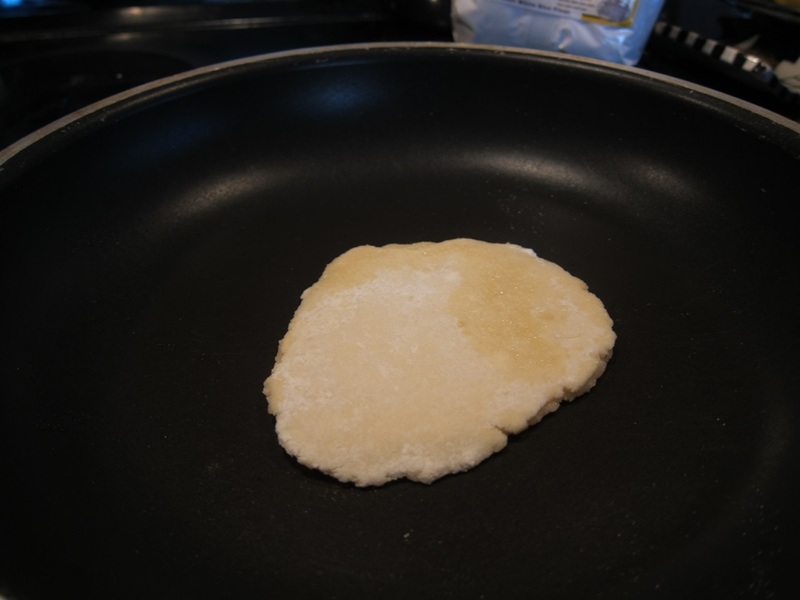 Place the rolled out pancake onto a clean kitchen towel or piece of paper towel. Brush the top well with the sesame oil, completely covering the surface. 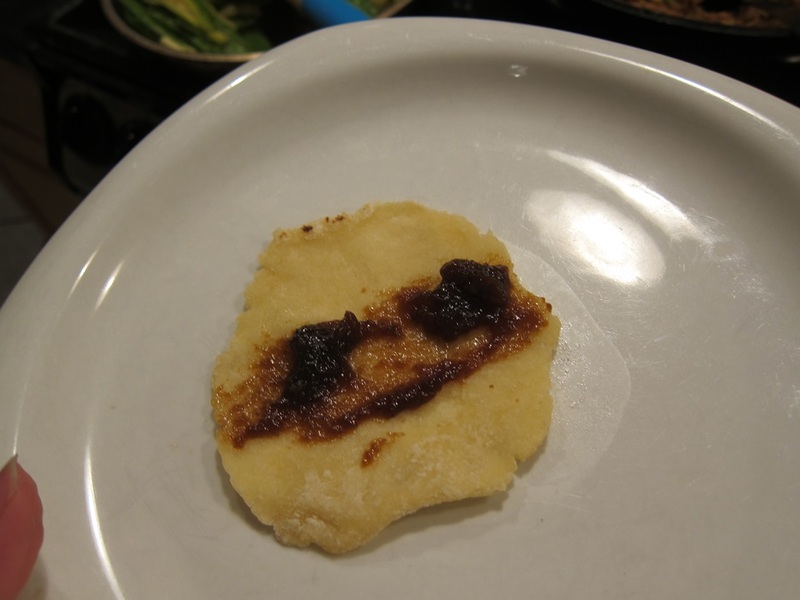 Roll out second ball of dough, and put it on top of the first, greased pancake. Cover the pair with a fold of towel/piece of paper towel. Roll out the rest of the dough, creating 8 greased pairs. It’s fine to stack them. 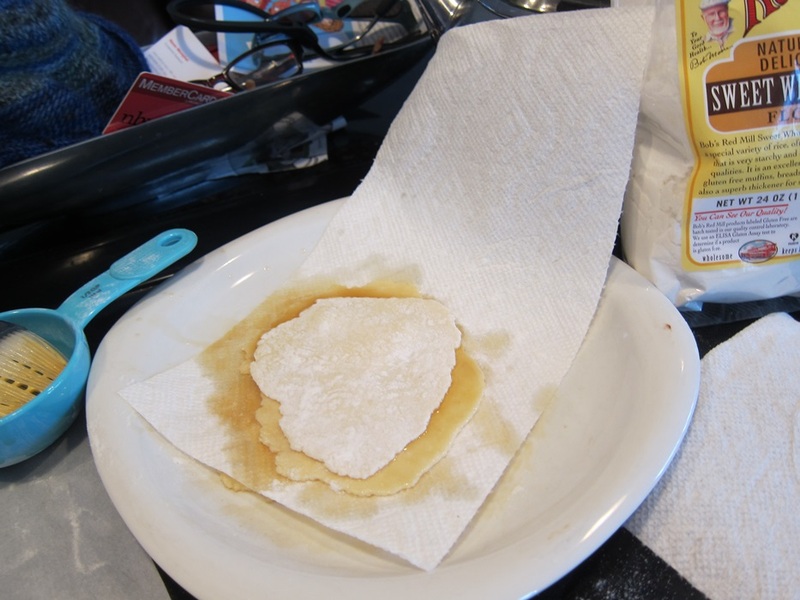 Place another clean kitchen towel/piece of paper towel on another clean plate. Heat a nonstick frying pan over medium high heat. Place one pancake pair, without any oil, into the heated pan, and cook about 30 seconds or until the top pancake forms air bubbles. Flip, and cook the second side another 30 seconds, or until the new top pancake begins to bubble. If they don’t seem to be bubbling, remove them from the heat anyway – you don’t want them to crisp or you won’t be able to wrap with them later. Once on the fresh lined plate, pull the two pancakes apart, and cover them with a fold of towel/piece of paper towel. 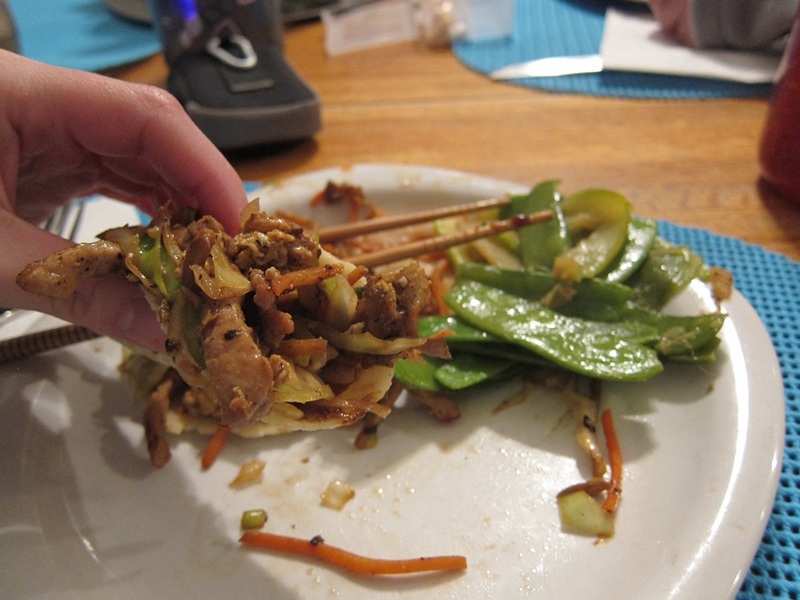 Cook the remaining pairs, then serve immediately or wrap tightly with plastic wrap. Heat the remaining tablespoon of oil and cook the garlic and green onions for 30 seconds. 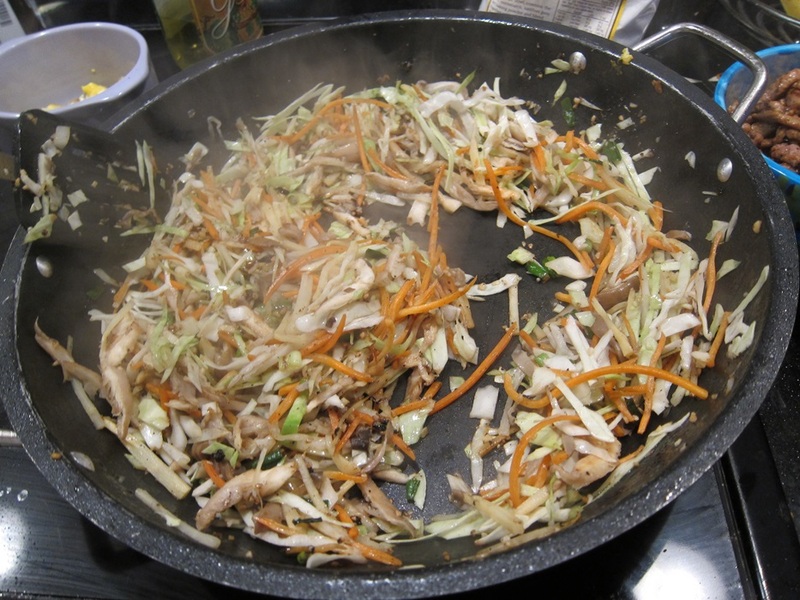 Add the wood ear, cabbage, carrots, and bamboo, and cook until the cabbage starts to wilt, about 3 minutes. 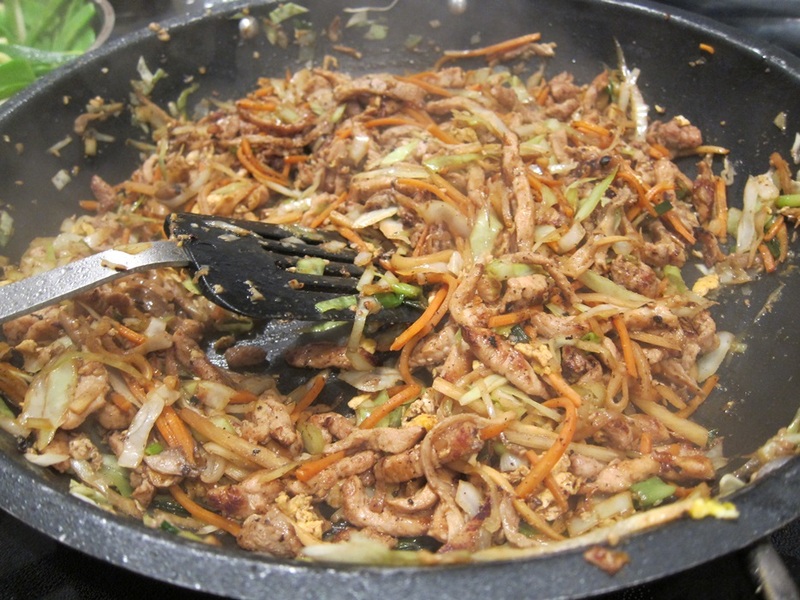 Add back the pork and eggs, and stir in the remaining tablespoon of soy sauce and the salt. Cook until heated through. 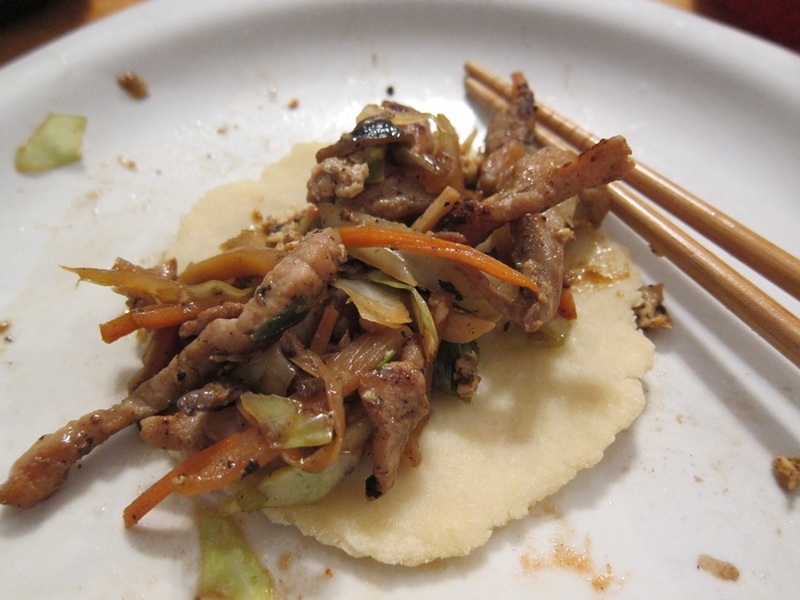 This entry was posted in Dinner and tagged gluten free, gluten free Chinese food, Mu Shi, Mu Shu Pork. Bookmark the permalink.